All of life is Advent. Until Jesus returns, we wait in hope in the midst of a broken world that yearns for restoration. May this simple Advent catechism help you and your family remember that though all is not well, all will be well because Jesus is king and he will return to undo all that is sad and broken in our hearts and neighborhoods. 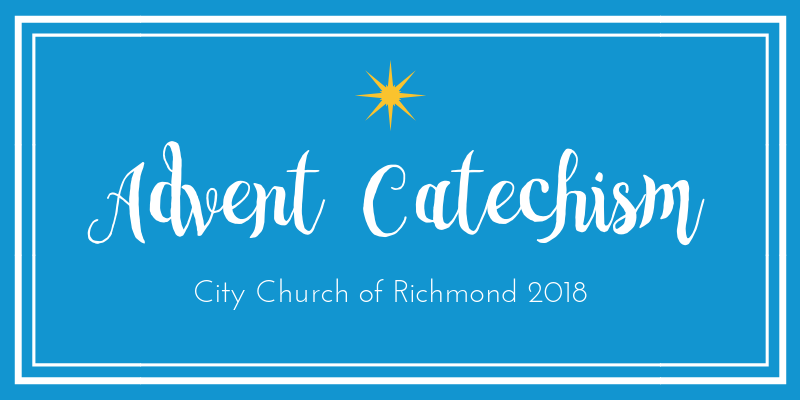 You may notice that there isn’t much about Christmas in this catechism (a catechism is a series of simple questions and answers used in the church to help us learn more about being Jesus followers). That is on purpose! Our culture has been consumed with Christmas since before Halloween it seems. Advent is a time where we can slow down and reflect on Jesus’ second coming. Feel free to talk about Christmas and Jesus coming as a baby, but also help your children (and yourself) understand that King Jesus is coming to make all things new. How to Use this Catechism: There are four to five questions and answers for each day of the week. The goal is not memorization, but discussion. Go through this catechism with your kids several times, perhaps reading the suggested Bible passage as well. May this be a simple tool that promotes more and more speech and prayer about Jesus this season. Question 1: What time of year is it? Question 2: What is Advent? Answer: A season of waiting. Question 3: Waiting for what? Answer: Waiting for Jesus to come back again! Question: Didn’t he already come to earth? Answer: Yes, as a baby. That’s why we celebrate Christmas! Question 5: Why did Jesus come to earth the first time? Answer: To save sinners like us. Questions 6: Why is Jesus coming back again? Answer: To make all things new. Question 7: When all things are new will there be any sad or broken things? Answer: No, Jesus will undo everything that is sad and broken. Question 8: What else will Jesus do when he comes back? Answer: He will give us resurrected bodies like his. Question 9: Will there be any more sin or hurt? Answer: No! Jesus will do away with all sin and hurting. Question 10: What will it be like? Answer: I don’t know, but we will be with him and every day will be the best day ever. Question 11: Is it hard to wait for Jesus to come back again? Answer: Yes, sometimes because life can be full of sadness, sin, and hurt. Question 12: What can we do while we wait? Answer: We can love God and our neighbor together with our church family. Question 13: Does God help us to love him and our neighbor? Answer: Yes! He gives us his Holy Spirit and each other. Question 14: What are some things the Holy Spirit does? Answer: He shows us more and more of Jesus, and he groans for Jesus to come back too! Question 15: Does anything else groan for Jesus to come back? Answer: Yes, not only does the Holy Spirit groan, but all of creation too! Question 16: Why does the creation groan? Answer: Because it too longs for sin and hurt and sadness to be gone. Question 17: Can anyone other than Jesus save us from our sin? Answer: No, only Jesus can save us from our sin. Question 18: Where is Jesus while we wait for him to come again? Answer: He is at God the Father’s right hand, praying for his people. Question 19: Why is Jesus praying for us? Answer: Because he knows us and loves us even better than we know ourselves. Question 20: Does Jesus love you no matter the bad things you do? Question 21: Does Jesus love you no matter the good things you do? Question 22: How do we know that Jesus loves us? Answer: We read it in God’s Word, the Bible. Question 23: What can we do with the good news that Jesus loves us? Answer: We can remember that truth every day and tell others who may not know. Question 24: What do we have to do to earn Jesus’ love? Answer: You can’t earn it, silly! Jesus gives it to us for free! Question 25: Has God given us anything else to demonstrate Jesus’ love? Answer: He has given us our church family where we read the Bible, sing, serve, and belong. Question 26: Is the church perfect? Answer: No, it’s full of sinners like me. Question 27: So when will everything be perfect? Answer: When Jesus finally comes back to make it that way! Question 28: And what time of year do we especially remember that? Answer: Right now, during Advent! You can download a PDF version of the Advent Catechism here. If you’d like to incorporate music into your family’s time spent with the Catechism—our just during Advent in general—we highly recommend Rain for Roots’ Waiting Songs, available on Apple Music/iTunes and Spotify.